The ultra compact ‘go everywhere’ first aid kit. The world’s only effective first aid keyring, for dealing with a surprising variety of minor wounds. Can be carried with you at all times, for those times you wish you had something for that nasty cut, graze or blister! There’s also space inside for storing a small supply of daily medicines, painkillers or emergency Aspirin. Compact, lightweight, tough and waterproof floating container; the MEDC First Aid Keyring is perfect for travel, sports, outdoor activities or any time you are away from larger first aid kits. The contents are completely protected inside the capsule, unlike other ‘pouch’ first aid kits where contents can quickly become crumpled, wet or dirty when carried in a pocket or bag. The MEDC First Aid Keyring is the most compact first aid kit on the market. While there are many good larger first aid kits available, when you are out and about and end up with a nasty little cut, the first aid kit left at home or in your car is of no help. The MEDC First Aid Keyring is small and light enough to never be left behind, and is a perfect functional addition to a set of keys, or kept in even the smallest handbag or sports pouch. The contents have been carefully selected to give the highest versatility in a compact package. Full instructions are included with the MEDC First Aid Keyring. Plasters are a thing of the past with the inclusion of Liquid Skin®; a medical grade tissue adhesive / wound sealant. Liquid Skin® acts to close and seal minor cuts, abrasions and blisters, reducing risk of infection, and providing a protective shield even on elbows, knees, fingers, neck, feet and other flexible parts of the body. The protective layer lasts up to 5 days, is waterproof, sweatproof, and after time will naturally come off. Liquid Skin® is easy to apply with the 1g applicator pipette, and is a sting-free formula that is safe for use on adults and children alike. The kit also includes a 5x5cm Low Adherent Dressing Pad, with a strip of Surgical Tape to allow attachment to the body. The Dressing Pad is highly absorbent and perfect for covering grazes or blisters, and slightly larger wounds that need pressure applied to reduce bleeding. The Wound Closure Strips are for closing clean, straight-edged lacerations (cuts), acting like a medical suture, but much safer, easier to use and remove. Combined with the Liquid Skin®, larger cuts can be dealt with effectively. Please note, the MEDC First Aid Keyring is intended for treating minor wounds only, not as a replacement for larger first aid kits, but as a useful ‘every day carry’ kit. MEDC Keyring Dimensions: 21.5mm dia x 86mm length. Weight: 26.7g. Assembled in the UK by Polymath Products. NB: Kit contents for use by adults only. Refill packs for the MEDC First Aid Keyring are also available to purchase (select the option above). Each refill pack includes two complete refill rolls. Refill rolls are protected in a tough plastic storage case, which could also be used as a compact first aid kit in its own right. Quick and easy to refill your MEDC First Aid Keyring; simply pop a refill roll into the empty capsule. Contents carefully selected for quality and usefulness, making the kit more versatile than a whole box of plasters. Each refill roll includes: Liquid Skin® – Formulated Medical Cyanoacrylate, a sterile Dressing Pad, Wound Closure Strips and a Surgical Tape Strip. Each refill roll also contains indications guidelines, and is externally printed with earliest expiry date of contents, allowing for quick checking of expiry dates. 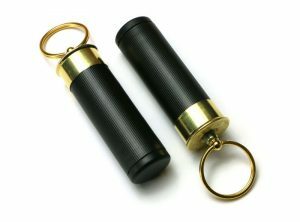 Ultra-bright glow-in-the-dark trolley/locker token, with stylish and convenient black nickel keyring holder. Pocket-sized anti-fogging/misting spray for motorcycle visors, cycling and ski goggles, virtual reality headsets and glasses. 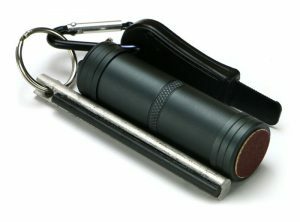 The ‘Every Day Carry’ fire lighting kit – light fires with ease, in any weather. 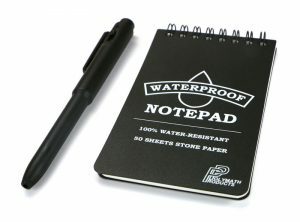 100% water-resistant stone paper notebook, write-anywhere pen, and durable nylon pocket/belt pouch. Keyring storage capsules. Stylish and secure way of carrying small everyday essentials. Attach-anywhere utility lights. 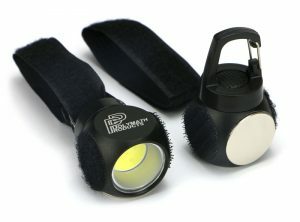 Pocket-sized, bright COB LED with magnetic, hook & loop, and clip attachment functions. Two per pack. Ultra-bright glow-in-the-dark zipper pulls. Ideal kit markers for coats, jackets, rucksacks and tent zippers.